ElasticWeb Review 2019: Is ElasticWeb a Good Hosting? Elastic Web Web provides adaptive hosting services where you pay just for the used server hardware resources. It was the first public hosting service to have its dedicated servers based on the Linux kernel and provide server resource usage analytics system. Elastic Web’s journey started in 2015. Instead of posing a restriction on its customers through a minimum and maximum cost, the company takes the cloud approach to the virtual hosting service. This way, it doesn’t limit its customers by the number of domains, subdomains or databases, and its customers can pay only for the server hardware resources they use. In 2015, Elastic Web patented its technology that monitors the server’s used hardware resources. Elastic Web’s headquarters are in Russia, while its datacenters are in Russia, Germany, France, and Ukraine. It serves a massive base of thousands of customers spread in over 10 countries. The company’s website supports English. Elastic Web’s usual uptime is 99%, which is a bit lower than the industry average. It provides three hosting plans – Start! (classic tariff), Elastic Web (unlimited tariff), and Strong (KVM or Kernel-based Virtual Machine). These plans vary in terms of CPU speed (10% and 1 x 2000 MHz to unlimited), RAM (256 MB and 2 GB to unlimited), storage (1 GB, and 20 GB to unlimited), bandwidth (1 TB to unlimited) and users (1 to unlimited). To use any of these plans, you have to create a hosting account (Elastic Web calls it creating a node) by selecting the PHP version (PHP 5.6 to 7.2), and set web-server configuration. In case you have domain, it will get automatically added to your account. Elastic Web also redirects all your clients to your website’s cache server in case your web server is down. Elastic Web’s USP lies in letting you build, deploy, and scale your website or web application easily, flexibly, and efficiently. Its entry-level plan is cheaper than the industry average. While its Elastic Web and Strong plans are payable on a daily basis, Start! is a monthly plan. You can pay for these plans via USD, deposit (applicable for legal persons), Bitcoins, Visa/Mastercard, QIWI Wallet, Alfa-Bank, Yandex.Money, WebMoney, or PayPal. Though Elastic Web doesn’t offer any money-back guarantee, you can always claim a return for unused funds in your account (in case you decide to discontinue using its services). You can reach the company’s support staff via email or a ticket system. Their standard time of response via the ticket system is 2-5 minutes. 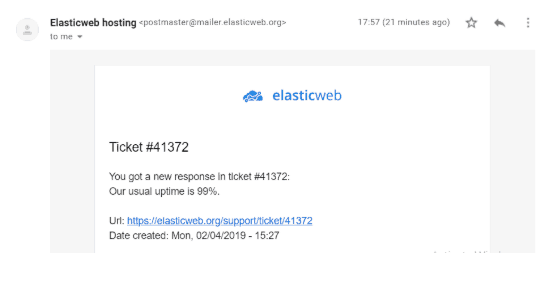 I found Elastic Web’s support staff to be extremely efficient as I got a response within 5 minutes of creating a ticket. If you believe in self-help, Elastic Web’s FAQ section (with documentation and articles) and blog will surely help. However, the blog section needs to provide some more information as it’s extremely limited at present with just two posts. 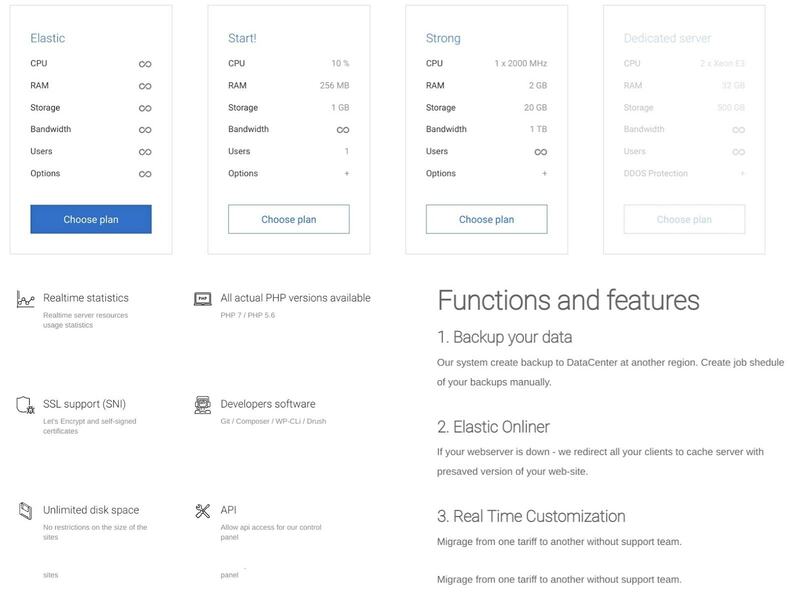 If you are looking for flexible and cost-effective hosting tariffs that allocate a fixed amount of resources for you or come without restrictions on hardware capacity, Elastic Web is your go-to option. Scale up your online performance with Elastic Web’s hosting plans. Wondering how ElasticWeb stacks up against other Web Hosting companies? Enter any other Web Hosting company and we will give you a side-by-side comparison.